Showing the archaeology of Ireland in one map? Richard Clutterbuck examines techniques for expressing monument distribution. The island of Ireland contains over 152,000 recorded archaeological monuments. That is a lot of archaeology, and it is difficult to visualise how it is distributed around the country. One way for a casual cartographer to express this was to produce a map of archaeological sites from the data available on-line. A distribution map of 152,000 dots would be difficult to interpret. A heat map provides a much better picture of the distribution of archaeological sites across the country. 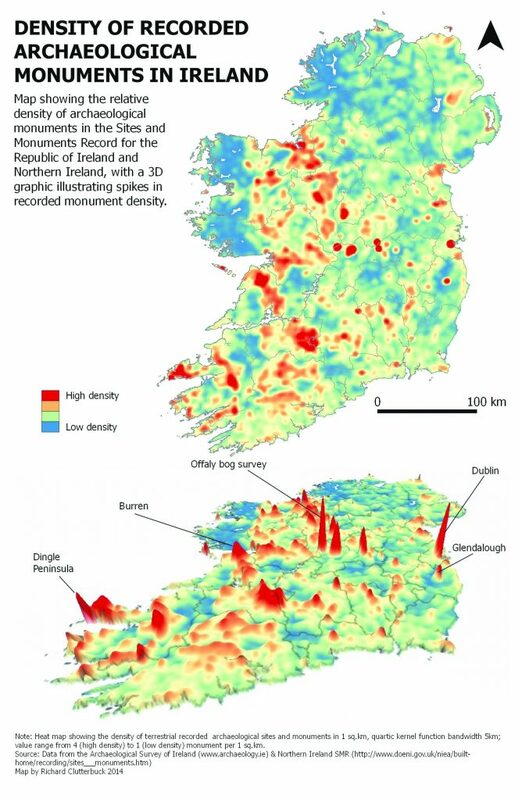 Showing dense concentrations of archaeological sites as a gradient from deep blue for low density to a livid red for high density tells us something about the variations in monument distribution around Ireland. Significant urban spaces like Dublin city have a high density of monuments, as do wetland environments like bogs in County Offaly where detailed survey work has been carried out. Places such as Glendalough, Co. Wicklow, the Burren, Co. Clare, the Dingle peninsula, Co. Kerry, or most of County Sligo have high concentrations of archaeological monuments. This can be further illustrated by expressing the density as hills and hollows. Here, Dublin stands out as a pinnacle of monuments, as does Offaly, whilst larger places like the Burren or Dingle, with smaller pinnacles, cover larger areas. In comparison, the distribution of monuments in the rest of the country seems almost sparse. This national map does prompt some questions, however. For starters, a considerable number of these monuments were initially identified for the Sites and Monuments Record from early edition six-inch maps by the Ordnance Survey of Ireland, meaning that, to a certain extent, modern archaeologists view the monumental landscape through a nineteenth-century prism. The dense distribution of recorded monuments in the central bogs of Ireland is a reflection of survey and excavation work in advance of peat-cutting. The large areas of low monument density in the west correspond with the blanket bogs of Connemara and Mayo. No doubt this picture will change as more archaeological sites are discovered, but certain areas of the country do seem to have higher concentrations of surviving monuments, and of monuments of particular types, than others. Perhaps even more significantly, this map would look completely different if the landscape itself was considered an archaeological entity. The work of recording archaeological sites over the past 50 years has been monumental in itself, and an incredibly worthwhile exercise in terms of both protecting our island’s heritage and providing information to the curious. But perhaps this encourages the treatment of landscapes as habitats for archaeological sites rather than as archaeological entities worthy of study in their own right. That said, the sheer density of archaeological sites and monuments helps to define landscapes like the Burren or Sligo. Techniques like Historic Landscape Characterisation and policies like the National Landscape Strategy for Ireland (2015) point towards a changing practice in the understanding of our material past, with perhaps a greater appreciation and acceptance of landscape as an archaeological concept. Whilst maps of monuments will remain an invaluable tool in understanding and protecting archaeological sites and landscapes, future maps of the archaeology of Ireland’s landscapes will, no doubt, provide the casual cartographer with more innovative insights. Note This map is one of over 100 produced for my Ph.D thesis, ‘Rural landscapes of improvement in Ireland, 1650–1850: an archaeological landscape study’, completed in 2015 in the Department of Archaeology, NUI Galway. It was produced using QGIS 2.4, with data downloaded from www.archaeology.ie and http://doeni.gov.uk/niea/built-home/recording/sites_monuments .htm.